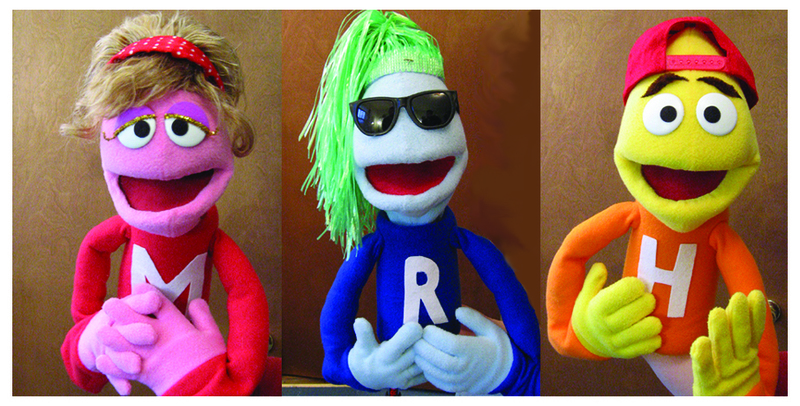 Melody, Rhythm and Harmony - the Rock-a-Baby puppets. Combine a live band, familiar rock-n-roll songs, and three clever puppets, and you get Rock-a-Baby, a musical learning experience for babies and toddlers. The classes originated in New York City, although watching a video from one of the NYC classes makes me glad I live in the much more low key (and less populous) state of Rhode Island. Madeline and I joined one of the first Providence sessions this fall with about a half dozen other children ranging in age from six months to three years. Each class, hosted by singer Kate, pianist Marc, and guitarist Benny, focused on a different ‘theme of the week’ with songs to match and a new instrument in the spotlight to explore. The format perfectly balanced the repetition kids need (starting class with the same song and ending with bubble time, for example), while offering some new exposure to instruments or musical concept. Even adults were entertained by the repertoire of songs and the Henson-like humor of the Rock-a-Baby puppets. Alas, as much as I loved Rock-a-Baby, Madeline is getting a bit old for it so we may try some classes at the RI Philharmonic this spring. I mean, she could be playing Beethoven’s waltzes at four-years-old. As for our new addition, Lucy, I’m sure she’ll be a Rock-a-Baby fan as soon as she can stay awake long enough to attend a class. The 2011 classes begin in January, but for a preview you can see the Rock-a-Baby group perform as part of the Bright Night celebration in Providence, RI on December 31 at 1:30 and 3:30 pm at the Providence Children’s Museum. I haven’t seen Rock-a-Baby yet, but we’re really excited to have them perform at the Children’s Museum on the 31st – especially since the talented Kate is one of our former AmeriCorps and staff members! Kate is awesome! Such a beautiful voice! We are hoping to make it to the Children’s Museum on the 31st to see them perform too.